Broadband Internet penetration in Estonia is 92%, which is one of the highest rates among European countries. At the moment, the Internet services sector is actively developing, stimulated by competition. Alongside Telia, the former monopolist, there are other providers on the market. 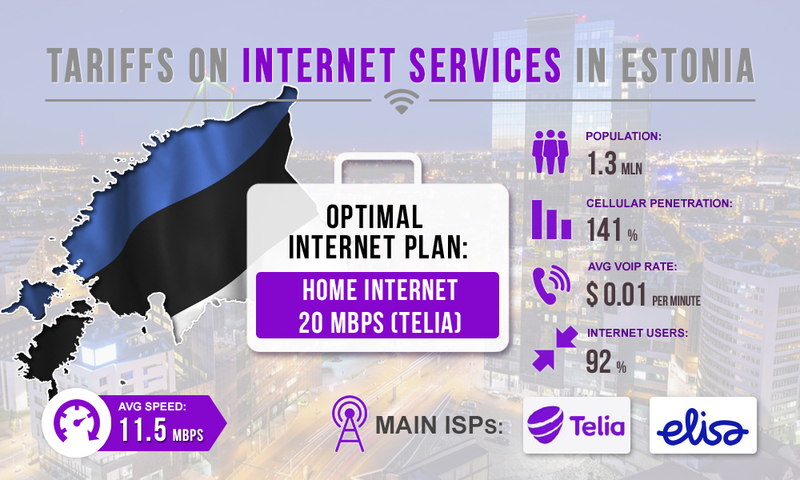 In addition to DSL, there is an opportunity to connect the VDSL, Fiber-Optic and G.fast Internet in Estonia. Let's discuss the cost of Internet services offered by the major market players to calculate business expenses for traffic termination. 5 Mbps. Data download speed - up to 5 Mbps., cost - $18.3 per month. 20 Mbps. Data download speed - up to 20 Mbps., cost - $24 per month. Internet XL. Data download speed - up to 500 Mbps., cost - $38 per month. Internet L. Data download speed - up to 150 Mbps., cost - $30 per month. Internet M. Data download speed - up to 50 Mbps., cost - $23 per month. Internet S. Data download speed - up to 10 Mbps., cost - $17 per month. Telia's 20 Mbps Internet plan will be the best option for the efficient operation of voip pc hardware. With this plan you will get a speed of up to 20 Mbps for $24 per month. Another excellent option would be the Internet M package from Elisa, with a speed of up to 50 Mbps and subscription fee of $23 per month. It all depends on the amount of equipment used and the number of GSM channels involved in the operation.